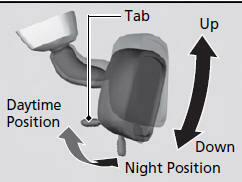 Adjust the angle of the rearview mirror when you are sitting in the correct driving position. Flip the tab to switch the position. The night position will help to reduce the glare from headlights behind you when driving after dark.